Single ply roofing is the most common and time-tested solution for commercial roofing. Single ply roofing systems come in many forms to best fit your budget and the needs of your facility. With flexibility, a competitive cost, and easy installation, there’s a good chance your facility can benefit from some type of single ply system. As one of the leading single ply roofing companies in Dayton, we offer quality roofing installation with reliable results. There are many types of single ply roofing membranes on the market today. When it comes to single ply roofing in Dayton, there’s a lot to like. A single ply roof membrane can offer a cost-effective solution with a minimally disruptive installation. Here are some important reasons to consider single ply for your facility. Built-Up Roofing (BUR) systems have been used for over a century. Also known as tar and gravel, these roofs require installing multiple layers of fabric and tar or asphalt to your roof. This is a labor-intensive and costly process. Single ply, by comparison, is much easier to install for lower labor costs. Single ply systems can also be installed in several ways to fit the unique design and slope of your roof. Single ply membranes are a budget-friendly solution to get a durable commercial roof. The cost of single ply can range from $1.50 to $10, but the average price is about $2 to $4. The cost of a single ply roof will depend on factors such as installation or attachment method, type of membrane, and the amount of flashing. Whether your roof is a tear-off or re-cover will also affect the price. When chemicals and fumes are a concern, a single ply system can be a wise investment. Even though chemicals should never be a concern for a roof due to tight regulations, you may be concerned about grease spills from traps, oil, and other issues. TPO is a good choice for a roof that may be exposed to grease and oil from stacks and vents. In this case,a second sacrificial layer can be applied around chemical sources. 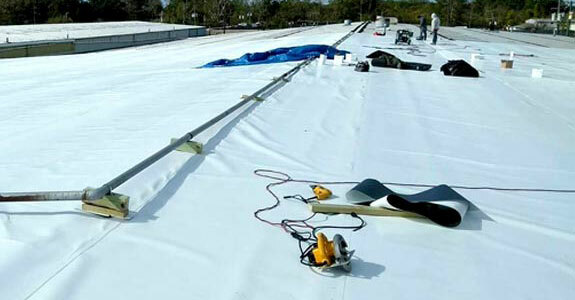 Single ply membrane systems are a good choice for weatherproofing against rain, snow, hail, wind, and sunlight. TPO membranes offer the greatest weatherproofing of all single ply options. A TPO roof can withstand heavy winds with seams welded shut. It’s UV ray resistance is also unbeatable. Single ply systems that are light-colored and reflective can dramatically reduce energy use for your facility. Upgrading to this type of single ply roof can also earn points toward Green Building Council LEED certification. Despite these benefits, single ply is not a perfect roofing system. Because it is only a single layer with no backup, single ply is more prone to punctures and leaks than a built-up roof, for example. Single ply has a shorter life than some other materials and it’s prone to developing water problems and issues with the seams. Quality installation and maintenance are the best ways to avoid these issues with your commercial single ply roofing. It’s hard to beat single ply membranes like PVC and TPO when it comes to reflective abilities. Choosing a white TPO, PVC, or EPDM roof creates a cool roof that can lower your energy costs by 15%. 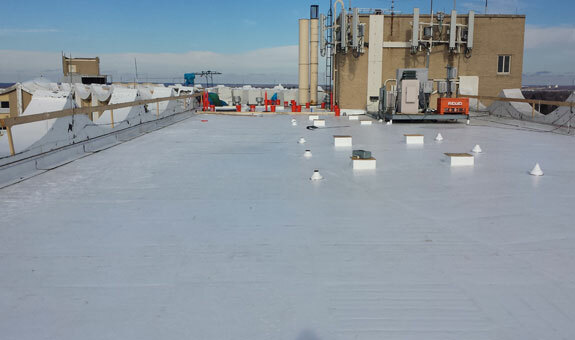 TPO is a thermoplastic single-ply membrane that makes up around 40% of the market for commercial roofing. TPO roofs are popular because they offer the benefits of EPDM and PVC with a lower upfront cost. TPO single ply membranes are made with ethylene, rubber, and propylene which are bound to a fiberglass filler for greater strength. Unlike many options, TPO membranes can be installed in many ways with even peel-and-stick products available. As with PVC, TPO membranes are hot air weldable for life. This makes it easier to perform repairs and maintenance on the roof. While TPO does not have the long track record of EPDM or PVC, it has become the gold standard of commercial roofing. It offers UV reflectivity comparable to PVC with superior sustainability, puncture resistance, and weather resistance than PVC and EPDM. EPDM roofing, also known as a rubber roof, is a popular choice for low-slope and flat roofs. EPDM membrane is made from a rubber polymer and offers many benefits, including very easy installation and excellent resistance to weather conditions. It’s hard to beat EPDM when it comes to withstanding UV damage that can make other roofing materials brittle. EPDM single ply roofing also holds up very well to high winds, hail, fire, low temperatures, thermal shock, and abrasion. EPDM roofing comes in unreinforced and reinforced styles, the latter of which can improve resistance to tears. It also comes in many thicknesses. If you have a very large roof, EPDM may be the ideal choice as it comes in very large sheets to reduce the number of seams. If a white acrylic roof coating is applied, an EPDM can even become a cool roof. PVC single ply roof membrane systems are made from PVC resin, pigments, fillers, stabilizers, and other additives. Unlike TPO, a PVC roof is naturally fire resistant without additives. PVC membranes have been used for decades with a good track record. PVC is an industry standard with cool roof benefits, easy maintenance and repairs, and it’s completely recyclable. When compared with other options, PVC has an affordable life-cycle cost. It retains its reflectivity over time to reduce energy use of your facility and prevent a hot roof. Its strong seam bonds and puncture resistance make it the superior choice for waterproofing. It’s also recommended for roofs exposed to chemicals and grease, such as food processing facilities and restaurants. Like EPDM, Hypalon or CSPE is a thermoset single ply membrane. It’s unique, though, because it’s made of a thermoplastic material that cures into a thermoset. Hypalon roof membranes must be heat sealed at the seams during installation. Unfortunately, as the roof ages, it can no longer be heat sealed which complicates repairs. This reinforced membrane has been used for 50 years with resistance to extreme temperatures, UV exposure, and compatibility with asphalt and modified bitumen. act now & get 10%off. Must Mention "jan 2018" on your first call. There are four ways to install a single ply roofing membrane. The best option depends on the type of membrane and your roof itself. 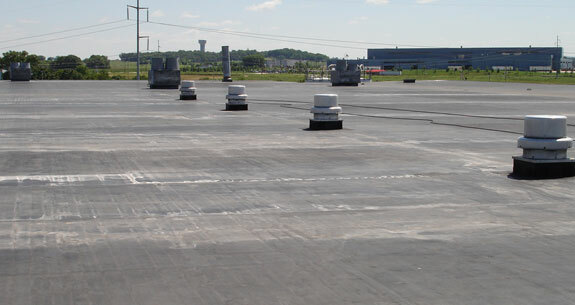 Our commercial roofing contractors perform all types of installation of single ply roofing in Dayton. This option will fasten the membrane by fixing mounting plates through your insulation to the roof deck. The membrane will be put in place and attached to the mounting plates. This method is best for roofs with very little slope. Mounting plates secure the insulation to the roof deck. The roofing membrane is then bonded to the insulation. This method offers fast coverage of your roof at a lower cost. Large membrane panels are loose-laid on the roof insulation and covered with a ballast. The ballasted installation method is only used when the roof can withstand the additional load. It isn’t an option with a slope of more than 1:6. If mechanical attachment can’t be used, induction-welding the membrane dramatically reduces the number of fasteners necessary. Have some questions about related services? Single ply roofing has a lot to offer with several options to fit your facility and budget. We take pride in offering high-quality single ply membrane installation with a focus on customer satisfaction. Not sure if single ply is right for your facility? Want to learn more about our installation process? Here are a few common questions we hear, but we are just a call away if you have other questions. Single ply roofing refers to non-asphalt-based roofing systems. There are many single ply systems but are all designed to be installed with a single membrane, as the name implies. Single ply has rapidly gained in popularity over the last 30 years for its flexibility, easy installation, and competitive price. Are there different types of single ply roofing? There are two broad types of single ply systems: thermoplastics and thermosets. A thermoset is a product that cannot be hot air welded as it will change physical properties. Instead, it must be installed with contact cement or tape. These roof membranes are made from a rubber polymer. The most common example is EPDM. EPDM roof membranes are popular for their ability to withstand weather for decades, even with fluctuating temperatures and UV exposure. Thermoplastic single ply roofs can be hot air welded to form laps. As the material cools, it returns to its original shape. The most common types of thermoplastic single ply membranes are TPO and PVC. Most thermoplastic membranes have a reinforcement layer that offers additional strength. Both types of single ply roofing are flexible and resist UV damage. How do I maintain my single ply roof? Regular maintenance is essential to prevent the most common problems associated with single ply roofing systems, such as seam issues and leaks. Facility managers and owners should have their single ply roof inspected periodically to make sure there are no punctures or loose seams. We recommend an inspection every spring and fall and after big storms. If any issues are discovered, they should be repaired as soon as possible before they get worse or lead to water damage. Roofing cement should not be used on any form of single ply roofing. You should also avoid mixing roofing membranes as they are not compatible with each other. EPDM should only be used with EPDM and TPO can only be used with TPO. If a tape form of peel-and-stick repair patch is used, it should be checked for adhesion and compatibility. These patches are only meant for temporary repair. When your roof is being inspected or repaired, make sure the contractors use walk pads. This will avoid further damage to the roof with foot traffic. One of the most expensive capital expenditures for any building owner is maintaining the roof. At eGreen Roofing Solutions roofing begins with education.